So it has been a while...I apologize. All these various digital things to update are hard to keep updated...That said I will give you a recap here and some reports to beat the heat. 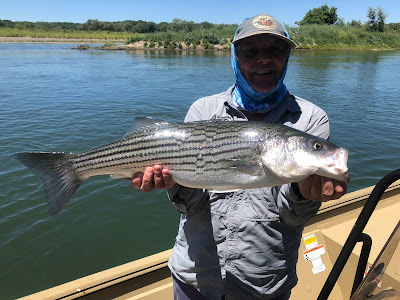 Most of my fishing the last month has been fishing and guiding for stripers on the Lower Sac from Conring down to Butte City. Fishing has been good to fair most days. We have had some great days and some tough days....pretty typical for June. 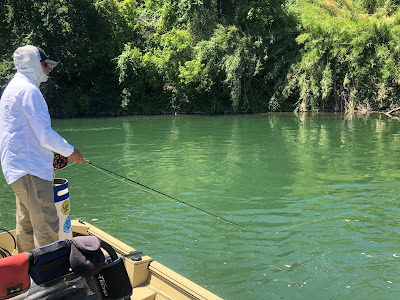 Water temps and Shad in the river moving around can really mess with the bite on a day to day basis. 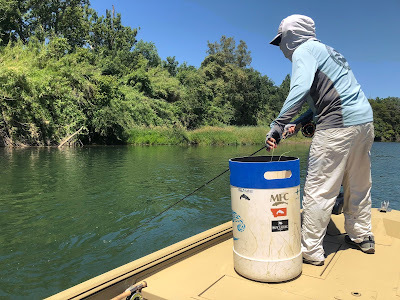 We have been experiancing a pretty significant heat wave the last few days so this should really solve the water temp issue warming up the water in areas that it has been colder and hopefully get the shad to move out or move on. River is in an interesting position this year as we didnt have super high flows over the winter so the weeds are coming up and we had a good shad run so fish will move into the shallows to feed but with shad in the river they are not foreced to move into the shallows yet. If I had to make an overreaching statement I would say the fishing is a bit late to get going with a good shad run...and that makes sense. That said there are some BIG fish around and good numbers of 4-8lb fish to fill in the gaps. 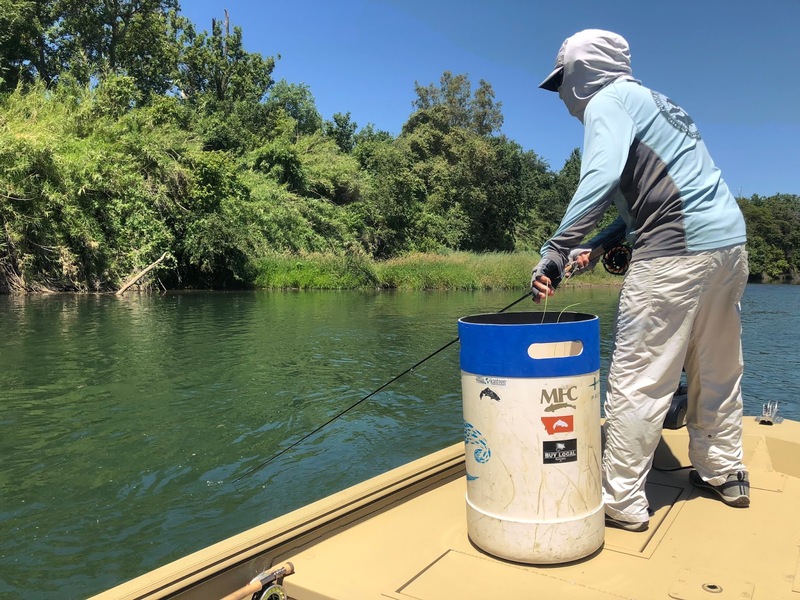 Other news...I am going to be locking up some new Yuba River access in the next month for the coming fall/winter trout and steelhead season so stay tuned for that. Going to be some big changes in access on the Ole'Yuba. Lots of good music in the mix over the last month. The new American Aquarium Album is good...not great but good. I am not sure if I have just listened to them to much or what but the new album just doesnt connect with me as much as the older stuff and I couldnt tell you why. I have heard a few tracks off the new Lucero album coming out this summer and it sounds pretty damn good so far. I love this band and continue to connect and dig on all their music they have made throughout the years. Other good albums I have been listening to are The Dead Tongues "Unsung Passage", Brent Cobb " Providence Canyon", and The Harmed Brothers "self titled"
My band Royal Oaks has been playing around the north state as well so if you have made it out to a show thank you!!!! We have a local Chico, CA show coming up at Argus down town Chico, CA on July 13th if you wanna come out I'll buy you a drink!